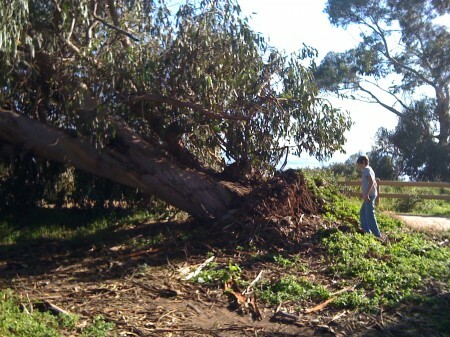 Back in January William and I took a walk at the Carpinteria bluffs, and saw that one of the big eucalyptus trees (Bluegum Eucalyptus, Eucalyptus globolus) along the Artists’ Passage had blown down in the wind. It was the easternmost tree, right where the path from the Bailard Avenue parking reaches the trees. The fallen tree was still there when I visited the bluffs today, and it actually seems to be doing okay for now; it’s at a steep angle, but the root ball seems to be more or less intact. I’m not sure if the city plans to do anything about it; I’ll have to ask Matt Roberts about that the next time I see him. I posted my photos to Bugguide.net, and Charley Eiseman (who else?) chimed in with some helpful pointers. 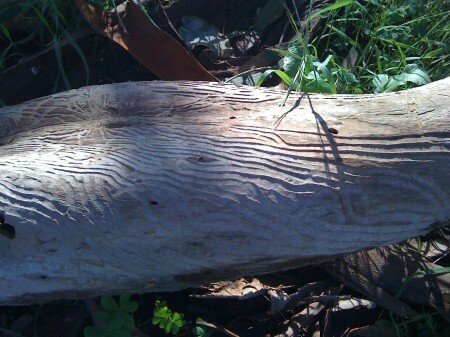 The current consensus at Bugguide is that these galleries were made by the larvae of a species of cerambycid bark beetle, specifically, Phoracantha semipunctata, the Eucalyptus Longhorned Borer. That area in the upper picture where a bunch of small galleries diverge is where the beetle’s eggs were laid. As the larvae eat their way through the tree’s cambium layer they, and the galleries they make, grow larger, until you get the really wide galleries like the one in the lower photo. Eventually each larva eats a hole into the wood and pupates in it, before emerging as an adult beetle to repeat the cycle. I think that’s probably a pupation hole in the lower photo. 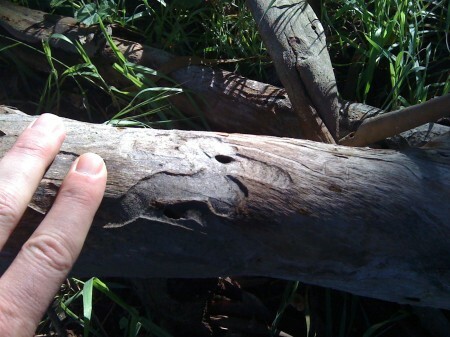 Like the trees they evolved to feed on, the Longhorned Borer is Australian. The Bluegum Eucalyptus trees were first brought to California from southern Queensland and Tasmania in the mid-1800s, and planted along the Southern Pacific Railroad lines as a source of lumber for railroad ties. According to Wikipedia, the railroad line that runs along the Artists’ Passage was completed in 1904, which I’m guessing is probably about the same time this row of trees was planted. The beetles arrived in California in the 1980s, and have apparently become something of a pest. The galleries they leave behind are certainly interesting to look at, though. Like the trees and the beetles, I’m not a native Carpinterian. I didn’t arrive here until 1995. You are currently browsing the Carp Without Cars blog archives for March, 2010.